Note : Minimum Qty Buy : 10 Pcs. 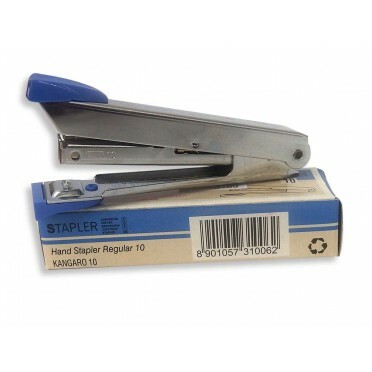 Kangaro Stapler Pin 1 Pkt. Brand:KangaroFor Household Applications, For Industrial Applications1000 Pins/PackIdealFor Shops, St..
Apsara Platinum Extra Dark Pencil - Pack of 10 Pkt. Features :Specially designed for executives, 2B GradeSuperior bonded lead is strong and resists brea..
Natraj Pencils - Pack of 10 Pkt. 10 Pencils in pkt1 Nataraj Sharpner1 Nataraj EraserBrand : Natraj1 Box = 10 Pkts = 100 pencils + 10 ..
1 Pkt contains 30 nos. of Glue SticksApplication : Glue sticks are designed to glue paper and card t.. Note : 1 pkt contains 20 nos. of pens.Ink Color : Blue, Black (As per choice)..
Write with style, use the best Cello Axis 0.7 mm Mechanical Pencil. Feel the fun of even scribbling,..